Louisiana Gov. Kathleen Blanco said Wednesday that the prosecutor in one of the so-called “Jena 6” cases has decided not to challenge an appellate ruling that sends the case to juvenile court. LaSalle Parish District Attorney Reed Walters had earlier said he would appeal the state appeals court’s decision that 17-year-old Mychal Bell’s second-degree battery conviction be set aside. The court ruled that Bell could not be tried as an adult. Blanco said she had spoken with Walters and asked him to reconsider pushing to keep the case in the adult courts system. She said Walters contacted her Wednesday to say he had decided not to appeal the ruling. “I want to thank him for this decision he has made,” Blanco said. Bell, who remains behind bars, was one of six Jena High School teens arrested after a December attack on a white student, Justin Barker. Five of the six teens initially were charged with attempted second-degree murder, though charges for four of them, including Bell, were later reduced. One teen hasn’t been arraigned, and the case of the sixth, handled as a juvenile, is sealed. Blanco made her announcement at a news conference with activists Martin Luther King III and the Rev. Al Sharpton. Sharpton said he hopes a bond will be set low enough to allow for Bell’s release, and he thanked Blanco for getting involved in the matter. Blanco said Walters gave her permission to announce his decision, and that he planned to discuss his decision publicly on Thursday. A phone call placed at Walters’ home went unanswered Wednesday. The case brought more than 20,000 protesters to the central Louisiana town of Jena last week in a marched that harkened back to the demonstrations of the 1950s and ’60s. Critics accuse local officials of prosecuting blacks more harshly than whites. They note that no charges were filed against three white teens suspended from the high school for allegedly hanging nooses in a tree on campus — an incident that was followed by fights between blacks and whites, including the attack on Barker. Walters has condemned the noose incident — calling it “abhorrent and stupid” in a New York Times op-ed piece Thursday — but said the act broke no Louisiana law. In the article, Walters defended the aggravated second-degree battery counts most of those charged in the attack on Barker now face. He said Barker was “blindsided,” knocked unconscious and kicked by at least six people, and would have faced “severe injury or death” had another student not intervened. Norman Hutchin’s song, “A move of God,” has been in my head all day. To Mychal Bell, Robert Bailey, Jr, Theo Shaw, Carwin Jones, Bryant Purvis, and the other unnamed young brotha, just hold on, change is coming. We should have progressed past this kind of unequal treatment based on race; however, we clearly are not. 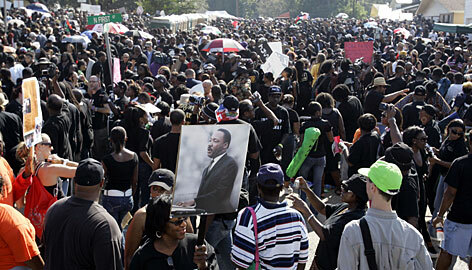 The outpouring of community support in the black community and the dearth of support from others is quite telling. Katrina became an enduring symbol of neglect and racial indifference and Jena, Louisiana has provided the nation with another. There is nothing particularly unique about the disproportionate felony charges meted out to these six teenage boys, this happens everyday to black children somewhere in America, as Al Sharpton has pointed out. What is unique is the black reaction the racially discriminatory actions of the LaSalle Parish School Board and LaSalle Parish District Attorney provoked. Today’s rally was amazing in its genesis and scale, as the song above says, “It’s a mighty move of God, it’s gonna change your day.” I feel confident in predicting that the charges against all six young men will be dropped. Praise God for Michael Baisden, Tom Joyner, Howard Witt, Amy Goodman, Roland Martin, Rev.Al, Rev. Jackson, Color of Change, the black blogosphere, and for the many black college students and other concerned persons who raised the alarm to inform the community when it was needed. Congresswoman Maxine Waters, on hand for the day’s events, told CNN’s Kyra Phillips that the House Judiciary Committee is preparing to subpoena the LaSalle Parish District Attorney to Washington to explain his conduct and the President himself said that the Justice Department is monitoring this case. Despite protestations to the contrary, there is a valid reason why Tina Jones, mother of Purvis Bryant, believes that the D.A. is “so adamant about destroying these kids lives.” I would love to hear his explanation of how a tennis shoe becomes a deadly weapon. The idea of a 21st century civil rights movement which focuses on the disproportionate punishment of people of color in the criminal justice system warms my heart. That’s something that this skeptical brotha can get with enthusiastically. Much remains to be done and it is not simply a local issue. I hope that that Congresswoman Waters and Congressman Conyers grasp that a comprehensive solution which addresses the lack of resources for indigent defense is at the root of the harsh and disproportionate treatment that our children and adults face nationwide.